Great News! The Central Navan received the Innovative Pub of the Year Award (Eastern Region) at the Vintners Federation of Ireland (VFI) Irish Pub Of The Year Awards Ceremony on Tuesday October 4th. 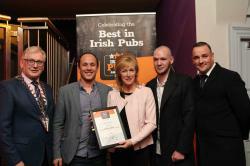 Pictured are our Leon, Tara and Enda accepting the award. We will now go on to take part in the National Awards Ceremony on Wednesday November 8th. Wish us luck ! Read all about the Awards here.